Government and Taxes: Climate Tricks 60, Alarmism cannot produce data of "unprecedented warming"
Climate Tricks 60, Alarmism cannot produce data of "unprecedented warming"
One of the persistent but debunked claims by the climate alarmism movement is that the recent, modern warm period is "unprecedented warming", meaning there were no precedents in global warming. A friend for instance commented in my fb thread about Earth Hour, "The level of CO2 heats up the Earth's atmosphere and we have record high temperatures. 2015 was a record high then until we got data from 2016 and, 2017 maybe even higher." I asked him these two questions: (1) What time or period of planet Earth's 4.6 B years that there was NO climate change? 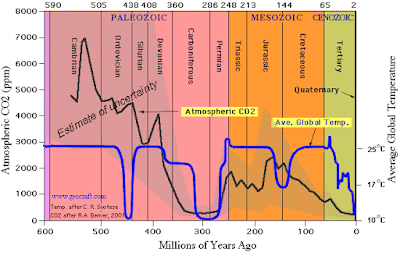 You have alternative data to this, 700 M years climate data? (2) What was it like before this "man-made" CC and "unprecedented warming": less rain, no rain, more rains? less flood, no flood, more flood? Proof and scientific papers? He replied and answered Q1 that indeed, there was no time or period that climate did not occur in the 4.6 B years of Earth's existence. Then he added, "remember when humans appeared on earth it's activities affected its atmosphere after it invented fire. Before, it was an awesome balance but man adversely affected this balance." And his indirect answer to Q2, "Before, it was an awesome balance." Wow, from what source? And what is that reference period of "before", 100 years ago? 1,000 years, 1 M year, or 100 M years ago, or farther? Similar claims would be "we have stronger and stronger typhoons, cyclones and hurricanes" -- ok, compared to when? Compared to 100 years ago? 1,000 years ago? 1 M years? Any scientific baseline? scientific source/s? Another friend asked, "Did our interventions and activities quicken the pace of climate change?" When you say "quicken the pace of cc", they mean there is less rain, less flood, than say 1,000 or 1 M years ago? Or more rain, more flood? 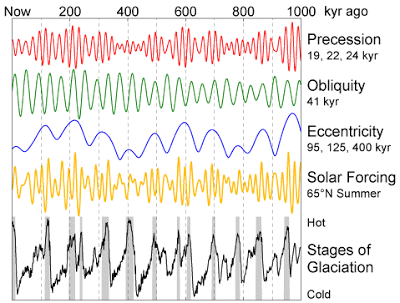 This is the planet's climate cycle since 1 M years ago. He insisted to introduce the "human variable" in the discussion, to see how human activities affected the natural climate cycle. Well, the "human variable" is here, at the far end of the chart, past 700 M years data. Current CO2 levels are far far lower compared to that period. What's so scary here? Here's a shorter timeframe, past 5,000 years. The "human variable" is at the far right of the chart. 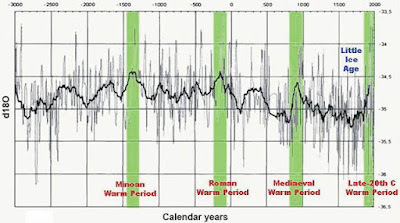 How different is it compared to the Medieval warm period? 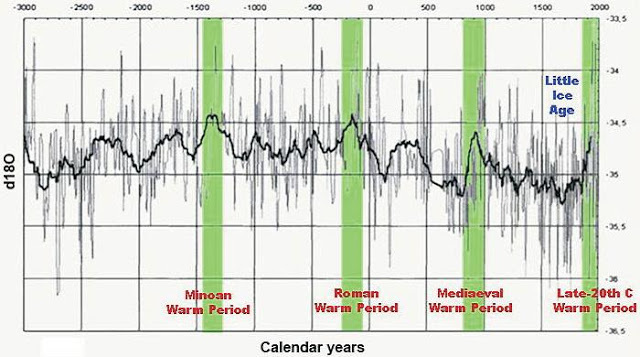 compared to the Roman warm period? 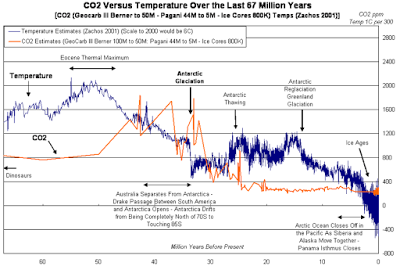 Data above say that recent or the past century's warming was nothing scary, nothing alarming, nothing frankensteining compared to past warming thousands and millions of years ago as claimed by the climate alarmists and scammers.